Probably the best way to explore Yangon on a budget is to take the Yangon circular train around the city. Trust me, this is not your ordinary travel experience. Taking the circular train in Yangon will get you through local neighborhoods, small towns and local markets. This experience is great if you want to experience first-hand the local culture. There’s no better way to find out more about the everyday life of people in Myanmar than to sit for 3 and half hours, in a train, with a bunch of locals. It was one of the highlights of my backpacking trip to Myanmar. Before getting deeper into the Yangon circular railway experience, I’ll tell you only one thing: expect the unexpected! To read more about the most beautiful temples in Yangon, click here. The Yangon circle line train was built by the British during the colonial times and it was opened in 1954. The train operates on a 45.9 kilometers long loop and it stops at 39 stations. This means that the Yangon circular train stops almost every kilometer, making it very convenient for local people to get around the city. This circular railway was built to connect the metropolitan area in Yangon and is used daily by tens of thousands of people. Although plans have been made to modernize the trains, they are still almost as old as the line itself. Some of the trains were imported from Hungary in 1960s while the newer ones, imported from Japan , were introduced in 2007. However, even the Japanese ones were already old when they were brought to Myanmar. If you’re looking for luxury or comfort, this is definitely not the place where you’ll find them. For me, this was an eye-opening experience. I thought that after traveling for so many months around Southeast Asia, I’ve seen it all. I couldn’t be more wrong but let’s start with the beginning of the story. My journey started at platform 7 at the Yangon Central Railway station (this is where I recommend to take the Yangon circular train), Myanmar’s largest train station, built by the British in 1877. There are no timetables with the train’s schedule or platform anywhere around the station. At least, not in English. I had to ask around to find out which is the platform where the circular train arrives. A local man told me that for the Yangon circular loop I have to buy the tickets directly from the platform. This was a bit unusual for me since almost everywhere around the world the tickets are sold in the train station’s main lobby. When I arrived at the platform indicated, I saw the ticket booth and bought the tickets. After waiting for about 45 minutes, a local man told me that the train will actually arrive at platform 5 so I followed all the local people and jumped over the train tracks to get to platform 5. Safety doesn’t seem to be a priority here but this was just the begging of my train journey around Yangon. I saw kids playing barefoot on the platform while using stones instead of chalk to draw on the pavement. I saw kids trying to sell water to tourists to make an extra penny. I saw families with bags of groceries heading towards their homes but most importantly, I saw teenagers with English books in their hands. For the young generation of Myanmar, learning English is a priority. After waiting for a few more minutes, I saw the train in the distance. It looked so old that it was a wander it was still functional. Once I got on the train, I couldn’t help but notice the old fans hanging from the ceiling (don’t expect aircon in the Yangon circular train) and the long, uncomfortable plastic benches along the wagon. In just a few minutes we started our 3 and a half hours ride, leaving behind the concrete buildings and making our way through the rice fields and small villages. For more awesome things to do in Yangon, click here. While on the outside the scenery was changing, on the inside something far more exciting was happening. People selling all kinds of fruits, vegetables and food started coming through with their big baskets. One after the other, each of them tried to gain as many customers as possible. The circular train in Yangon turned into an open market where people happily did their groceries. After another half an hour, everybody seemed to forget about all the chaos caused by the sellers and turned back to their previous activities. A man was taking his afternoon nap on the bench, a woman was breastfeeding her child and a teenager was reading an English book. Tip: Make sure to use the toilet before getting on the train. The Yangon circular train toilet is not something you want to experience. At about the half of the ride the train stopped and there was a lot of noise coming from outside. When I looked through the window I was surprised to see tens of people selling fruits and vegetables on the train tracks. People from the train got off, went to the Yangon circle train market, did the groceries and came back with their bags full. It was incredible to have the opportunity to be so close to the daily life of Burmese people. For 3 and a half hours I had the chance to be one of them, to really experience what it’s like to live in Yangon’s suburbs. 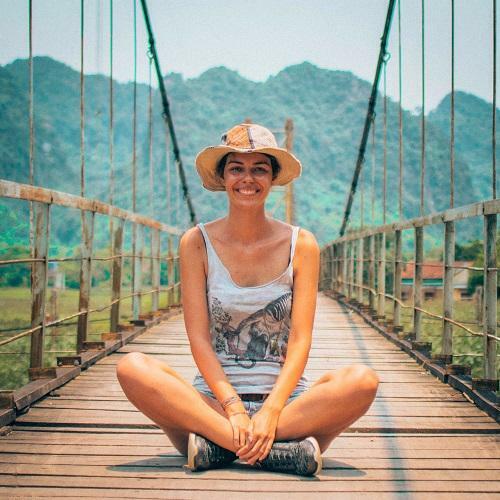 Seeing Yangon by circular train was an experience that I will value all my life because it has thought me an important lesson: poverty and kindness go hand in hand in Myanmar. The Burmese people are the kindest, most welcoming people I’ve met in my journey around Southeast Asia. They’ve made my stay in Myanmar unforgettable. Also, I’ve learnt another important lesson: my definition of struggle can be somebody else’s definition of a decent life. This realization made me humble and grateful for this amazing experience. To see which are some of the most beautiful places in Myanmar, click here. I recommend starting and ending your journey at the Yangon Central Railway station. This is the biggest station along the circular train route. Here, because there are many employees and they are used to tourists, you can get all the information you need (train schedule, stations). Choosing other stations to start your journey automatically means that the chance to find people who speak English is lower. The train functions on two rails going both directions (clockwise and counter clockwise). If you want to take advantage of the rush hour when the train is very busy, you should take the train either early in the morning or in the afternoon. During the day, the train is moderately busy. Below is the Yangon circular train schedule for both directions (you can choose any of them). Please keep in mind that this timetable is not always accurate and the circular train can be late. To check out the Yangon circular train route, please see the map below. The circular railway is the one colored in red. 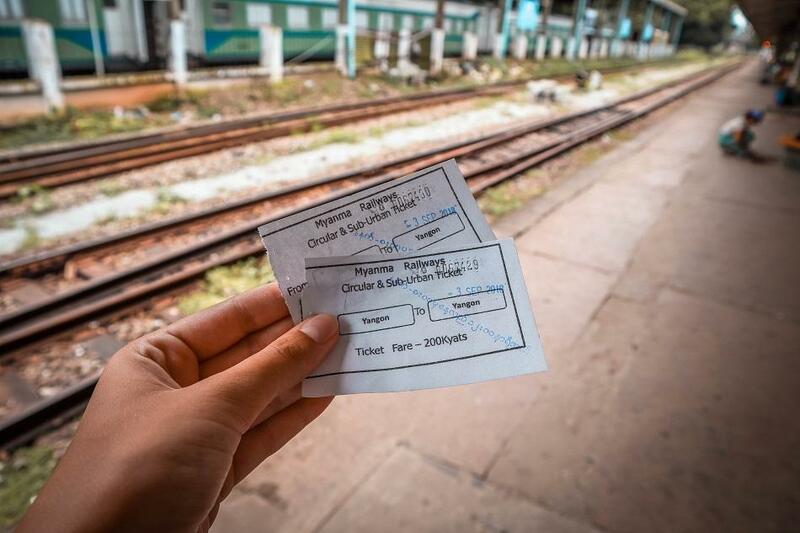 To buy tickets for the Yangon circular train you will have to go directly to the platform where the train arrives (usually platform 7 but it can change so you’ll have to ask). The price for one ticket is 200 Kiats ($0.13). I’ve heard stories that sometimes the employees selling the tickets will ask for more money if they see that you are a tourist. Keep in mind that the real Yangon circular train price is 200 Kiats and don’t agree to pay more. After paying, you will receive a paper ticket – don’t throw it away. Riding the circular railway in Yangon was one of the highlights of my trip to Myanmar. The people are extremely friendly and it has been an honor to be part of their lives for a few hours. If I’m going back, I’ll definitely explore Yangon by circular train again! Fore more awesome tips & tricks about planning your trip to Myanmar, check out the Lonely Planet guide. Hey! Excellent post about the circular train! I only have one question. Is the 200kiats ticket good for the entire day or every time you get off and on the train, you have to buy a new ticket? Thanks! Hey! As far as I know you will have to buy a ticket each time you get in the train! The ticket is really cheap and I wouldn’t risk it. You can also ask as the Yangon Central Station! The people are really nice and helpful! Enjoy your ride!